In an industry overwhelmingly dominated by men, Smita Grosse has smashed through the (sugar) glass ceiling to be selected as the first female Executive Pastry Chef for Grand Hyatt Hong Kong. Helming a team of 30, multi-award winning Grosse is responsible for the breads, pastries and desserts for all 11 of the hotel’s restaurants and bars as well as some 200 events held every month within and outside the hotel. Grosse grew up on the island nation of Mauritius in the Indian Ocean in a household where her father loved to experiment while cooking. While studying at the Hotel School of Mauritius, Grosse spent two years interning at One&Only Le Saint Géran, after which she was immediately snapped up as a pastry commis. From there, Grosse rose through the pastry chef ranks at The Ritz-Carlton Dubai, Shangri-La Hotel Dubai, Burj Al Arab Jumeirah, Galaxy Macau and Fairmont Singapore before becoming Executive Pastry Chef for the first time in 2017 at Hotel Indonesia Kempinksi Jakarta. 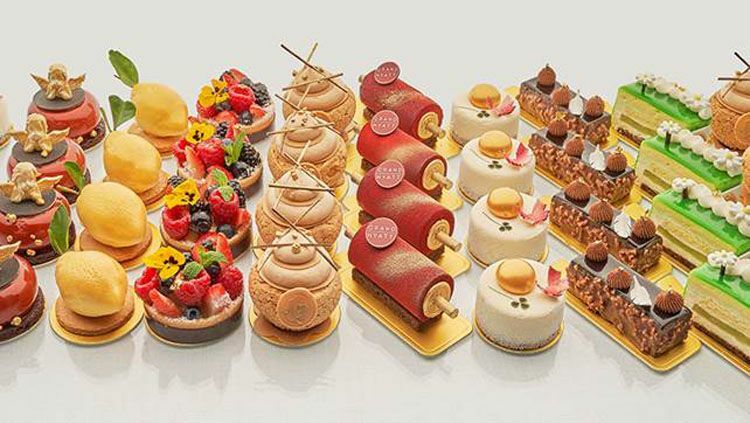 Above: Some of Grosse’s exquisite culinary creations, exclusively available at Chocolatier. Particularly popular is the ‘Lemon’—whipped yuzu ganache and lemon and mint marmalade encased in white chocolate on a base of lemon Breton biscuit. And the ‘Forbidden Apple’ comprising layers of sponge, cheesecake, apple mousse and calamansi chiboust (cream). While ‘healthy cakes’ may seem like an oxymoron, customers are demanding cakes that incorporate less fat and sugar, but taste every bit as sinful. And with gluten intolerance on the rise, Grosse has created two gluten-free cakes that everyone can enjoy; the ‘Versailles’ comprising moist chocolate cake, whipped organic chocolate and popping candy and the ‘Douceur Marron’ featuring chestnut cake, whipped vanilla ganache, pear compote and hazelnut crunch. She is also working on new pralines incorporating organic, vegan chocolate. When asked to cite a dessert she is particularly proud of, Grosse mentions one they crafted recently for a corporate client. “We were asked to design 550 desserts around a circus theme so we constructed a hot dog with brioche as the ‘bun’, chocolate ice cream as the ‘sausage’, mango jelly as ‘cheese’, custard as ‘mayo’ and raspberry sauce as ‘ketchup’. Beside it was a pile of ‘fries’ made from toasted pound cake and a Coca-Cola bottle filled with Jack Daniel’s flavoured jello.